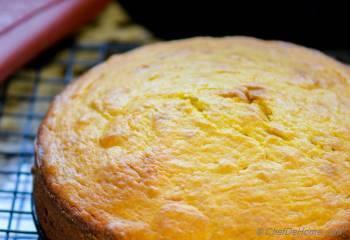 An easy and moist mango pound cake made with basic ingredients. 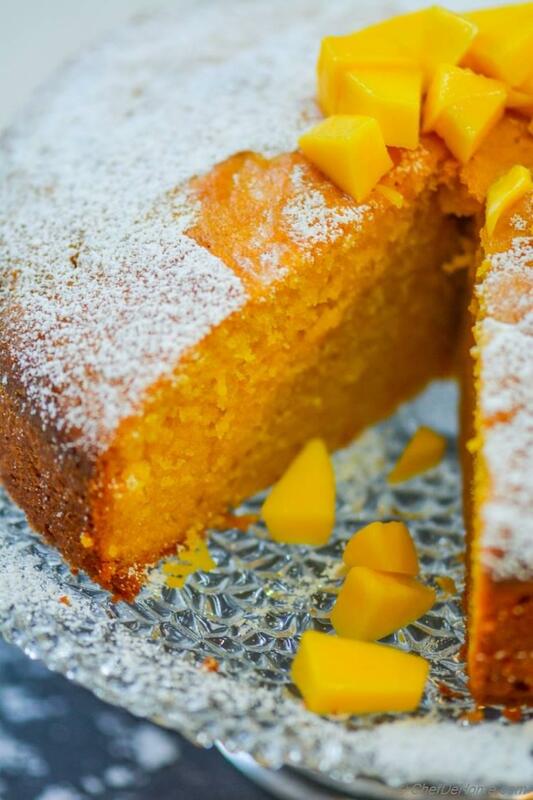 This moist, mango pound cake needs nothing more than a dusting of confectioner's sugar to set off it's classic looks. 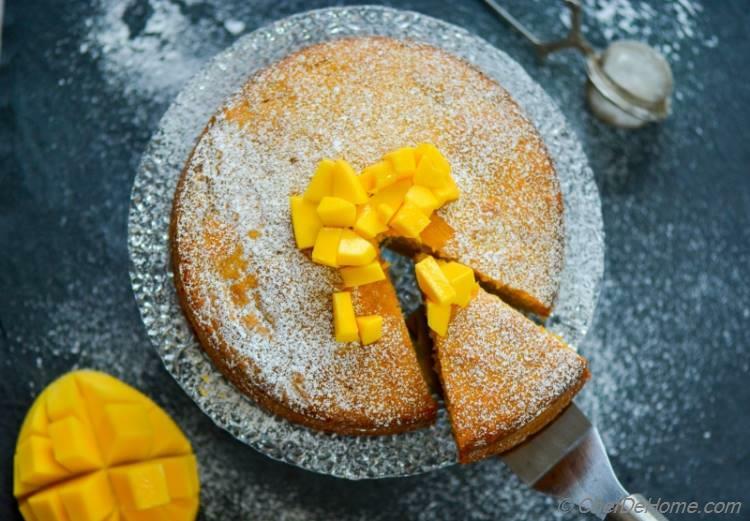 With rich tropical mango taste, and subtle notes of coconut, this easy cake is an excellent dessert to keep in mind when you have a houseful of guests. Summers mark the OFFICIAL Mango season and it will not be fare if we don't enjoy some delicious mango desserts. Isn't it? Can you believe, this is my first seasonal cake recipe, on blog, this year? Even though I love baking and addicted to baking breads whole season, cakes and desserts always take a back seat. Even at thought of making something sweet, my "savory" mind redirects me to a different route! For similar reasons, cake I bake are often fruit cakes which need nothing more than dusting of powder sugar and a dollop of sweetened heavy cream, at the maximum! Such cakes can be served for an informal dessert course and are even great for tea-time snacking or a family brunch. I specially love the fact that I can simply wrap the leftovers in plastic wrap and savor a slice with tea next day. Trust me, on contrary to box-mix, or artificial flavored cakes....... fresh fruit based cakes taste even BETTER the next day. Pound cakes are mostly served dusted with powdered sugar. One reason, because these cakes are so rich and moist, that icing or frosting is not required! To keep this cake rich and moist yet milk and cream free, I have used coconut milk instead of dairy cream. Whole-fat Coconut milk not just beautifully replace heavy cream, but also gives this cake a delicious coconut taste. PS: To make this cake fully dairy free, you have to replace butter with canola oil, coconut oil or cocoa butter. For an authentic homemade texture, I bake everything from scratch and always use unbleached all-purpose flour or gluten free nut-flours for baking breads and cakes. For home baking, I don't want that fine texture which is courtesy of extra fine-ground flours like cake flours. Trust me, more fine the flour is; more mess it creates in our body. I always have a container of all-purpose flour in pantry and I use it for almost everything. A good quality unbleached all-purpose flour is really good enough for most home baking. In-fact, while baking breads, I add a portion of Whole Wheat Flour to incorporate whole wheat nutrition into many baked goods. One simple question to ask: Why are we baking at home? In my books, to keep it health-friendly, wholesome, and yet tasting good. In my honest opinion, if you need those fine, pure-white cakes, it is cheaper to buy one from store! But! Caution! It also comes laden with lots of unhealthy ingredients like - bleached extra-fine flours, corn syrup, artificial preservatives, and artificial flavor enhancers. 2) Always make sure oven is well preheated. 3) Always measure ingredients properly. 4) Never over-bake the cake. 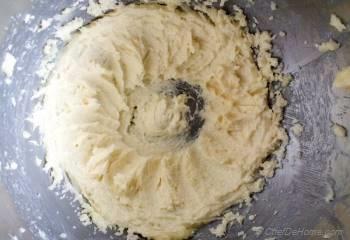 5) Don't over-mix the batter. 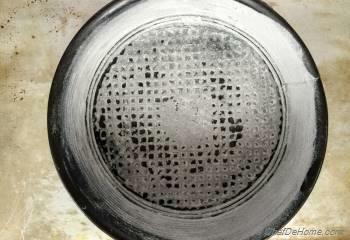 6) Don't remove cake from pan too early or too late. Even though this is my first seasonal cake of the year...... I'm certain, my love for seasonal fruits and twisted classics have made to blog before. Specially, if you are looking for an eggless cake, I highly recommend trying the Egg less Mango Cake with Chocolate Glaze. 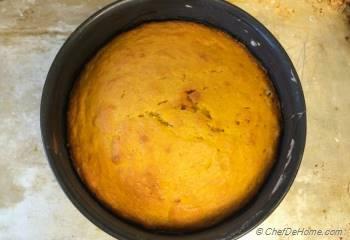 Try this recipe and you will be surprised - how moist, rich, and delicious an egg-less cake can be! Don't wait friends! Weekend is finally here! 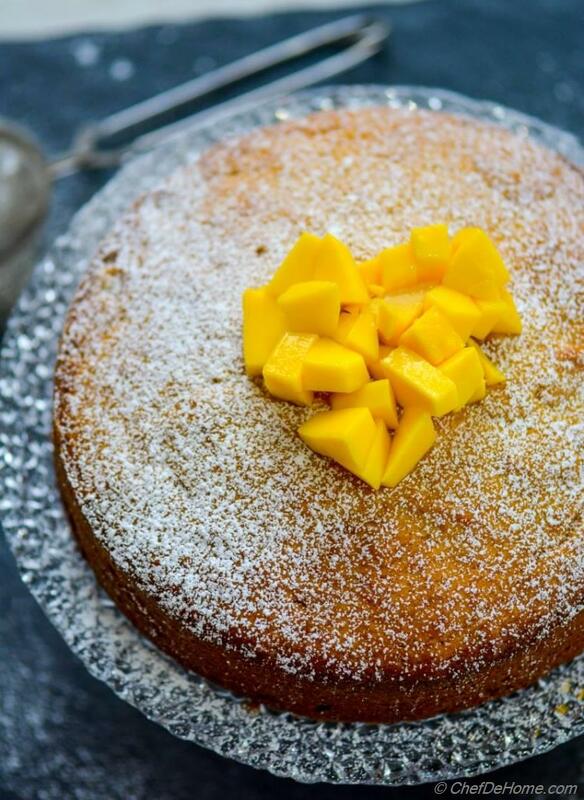 Go get some mangoes, make Mango Pound Cake and enjoy with family! Total Time 1 hr 20 mins Prep Time 15 minutes Cook Time 1 hr 5 mins Difficulty Easy Yields 7" Pound Cake Serves 8 Notes No. of servings depends on serving size! 2. 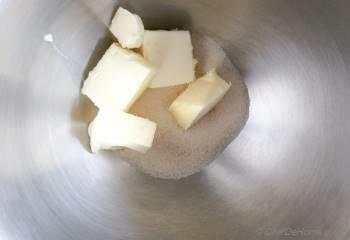 Using a hand mixer or stand mixer, cream together room temperature butter and sugar until pale yellow in color. 4. With mixer running at low add 2 eggs (one at a time), blending well after adding each egg. 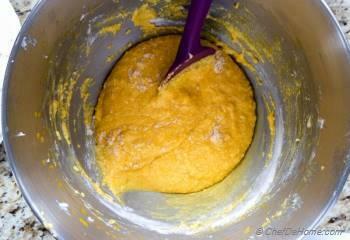 Also add coconut extract, coconut milk, oil, and 1/2 cup mango while mixing. Mix on medium for good 4 minutes or until mixture has good volume, and is creamy. Make sure you use good quality ripe mangoes like you get in Indian stores. Please don't use white, low-sweet mangoes. Those won't make good cake. 5. In a bowl, add flour, salt, baking powder, and baking soda and sift together. Add 2 batch flour to wet mixture, 1/3 at a time, and fold with rubber spatula after every addition. 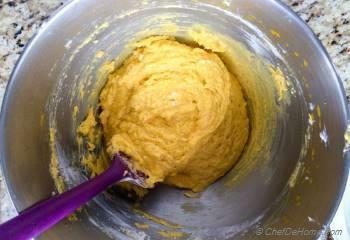 Then add remaining 1/4 cup mango puree, last batch of flour and fold in. 6. Don't over mix. Just use gentle strokes until dry flour is moistened. Over-mix will make cake very dry. So use gentle few strokes. 7. Transfer batter to baking pan and bake for 65-70 minutes or until cake is golden brown and tooth pick inserted in the center comes out clean. 8. Leave the cake on kitchen counter for 5 minutes. 9. Then loosen the edges with knife and flip the cake on cooling rack. Cool the cake completely before slicing. For personal preference, I have kept this mango cake very lite sweet. You can add 1/4 cup more sugar if you like sweeter cakes. 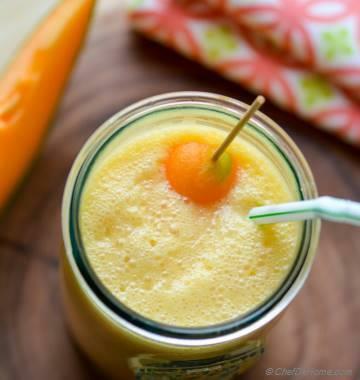 If can't find fresh mangoes, you can also use frozen mango puree. Thaw it fully before using. OMG, this cake is the tastiest cake I’ve ever had. Fresh mango on top is a must. I double the recipe and have made it 6 times so far. I think today’s version is the best so far. I did half coconut extract and half vanilla extract— add a little extra of both. I also substituted a tbsp of coconut butter for either the oil or the butter. One of my favorite desserts to make by far. Thanks for sharing your experience. I'm glad you enjoyed Mango Cake. Oil makes cake more moist. I never baked it without it though. So, can’t say how much will it affect. Hi, I tried your recipe twice. The first time the cake turned out simply awesome. The second time I followed the recipe exactly the same way but the cake sank and didn’t rise well. Could you tell what makes cake sink and make it dense, moist and have gluey streaks at the base of the cake. It might look as if it’s under baked but it was completely baked properly having nice soft moist texture. OK so I made this using 1 cup of sugar and I found it really sweet....3/4 cup would have been plenty! I used sour cream in place of the coconut milk. The cake was baked in a 9 inch round cake tin... for 40 minutes( any longer and it would have burned! )The cake texture was nice and moist. My mother loved it...but I found that the mango flavours are lost after baking. Dont think I will be making this one again...unless my mother requests it! 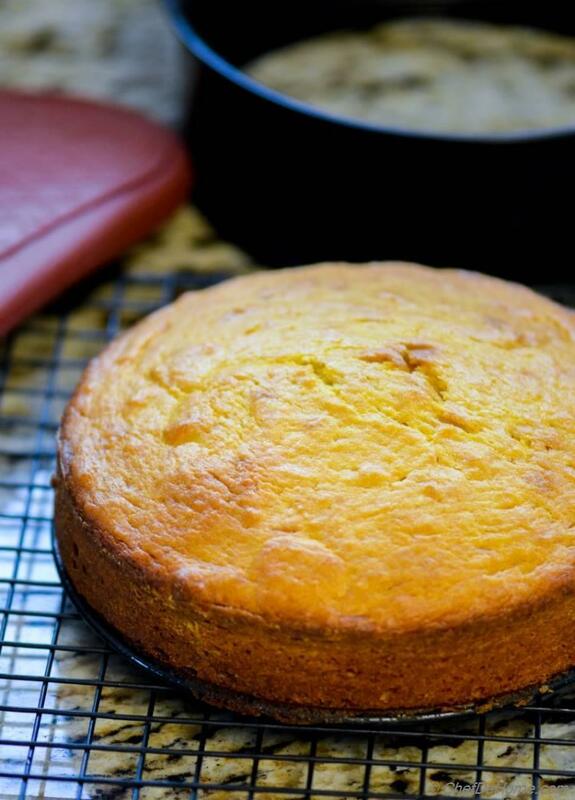 Hi, I'm looking for a mango orange cake recipe and really like the sound of this one. Could I add an orange juice to the batter and if so, how much would you suggest? Hi Eva, I have never tried this but it should not be an issue. 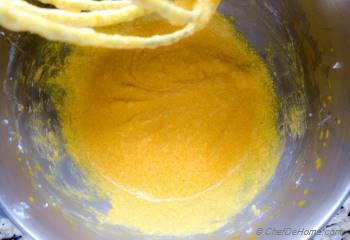 I think, best will be to use orange zest, and add orange juice when you make mango puree. I would make sure consistency of batter is same as shown in video. For more pronounced orange flavor, use orange essence. I hope it helps. 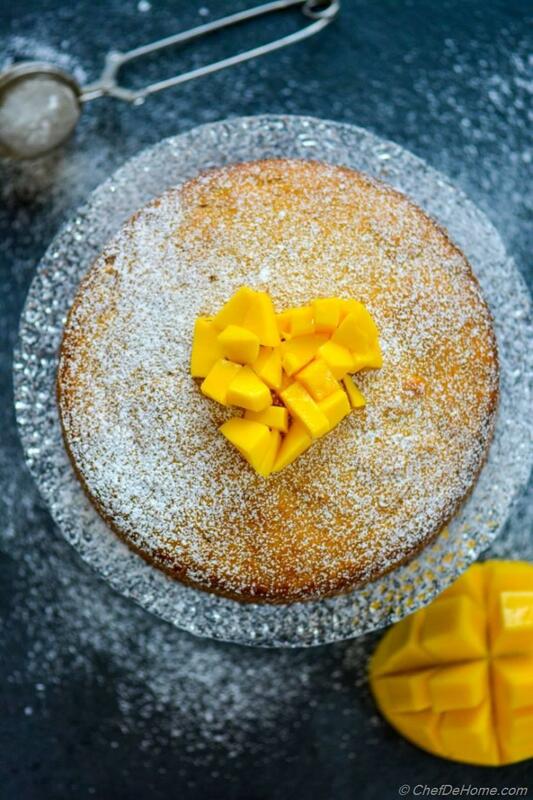 Can you tell me if this mango cake would freeze, I made it on Friday but don t need it until Tuesday? Hi Linda, I have never frozen this cake. Let us know if you try that would be helpful for other readers as well. Cake is good. I put apricot jam a melted chocolate on top. wow! this was awesome. also, it was a small cake just for our family of 3. Superb! I did not use coconut milk since did not have them! I loved it, and want to make it in a 9x14 pan this time for my daughters birthday party. Do you think there will be enough batter? Would it work doubling the recipe? Or should I make 2 separate batches of the batter and pour both into the bigger pan? Hi Diane, thanks for sweet feedback. 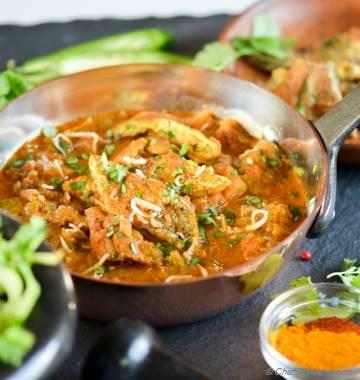 This recipe can be doubled or halved easily. But making a bigger batch mean I would have to adjust the cooking time unless I bake two batches. I hope it helps. Can I bake this in a loaf pan or muffin tray for cupcake sizes instead? Do you know the bake time and temperature by chance? Cindy, you can certainly bake these in muffin tins. I would bake it 10-12 minutes or until tooth pick inserted in center comes out almost clean. (just like any regular muffin recipe). I hope it helps. I am about to try this recipe. I had one query. Can I use a regular hand whisk to mix all the ingredients instead of an electric one? We are in the middle of moving and tomorrow is my husbands birthday, hence the query! I fear hand whisk will need lot more time. For consistency, check my video from notes and see how batter looks. I would whisk eggs with suagr until creamy and sugar full dissolved. I hope it helps. Hi Savita, I don't have a 7 inch cake pan on hand. Do you think this recipe will still work with a 9 inch cake pan? Hi Carolyn, It should work fine in 9". 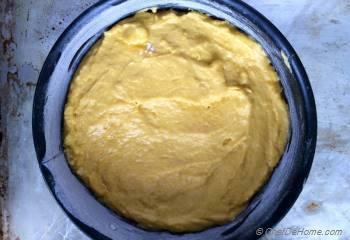 If you look at my mango cake video, I used same batter in 9" spring foam pan. I hope it helps. Hi Savita, this cake is delicious - - coconut and mango taste was subtle but distinct. I used coconut oil instead of canola and added 1/4 cup sugar as you've suggested to bring forth the mango taste. However, my cake turned out wet at the bottom, even though i followed directions. I creamed the sugar and butter till light and fluffy, about 4 minutes, and added the eggs one by one, about 30 seconds each, then added the liquid ingredients, mixing for 4 mins. Where did i go wrong? Hi Peck, only thing I can think of is temperature - did the ingredient you use - eggs specially were at room temperature? Also, I shared a video of making this mango cake. Please view the video to see if things looked the way (consistency wise) as shown in video. thanks for sharing your experience. Done baking this cake... so delicious..!! 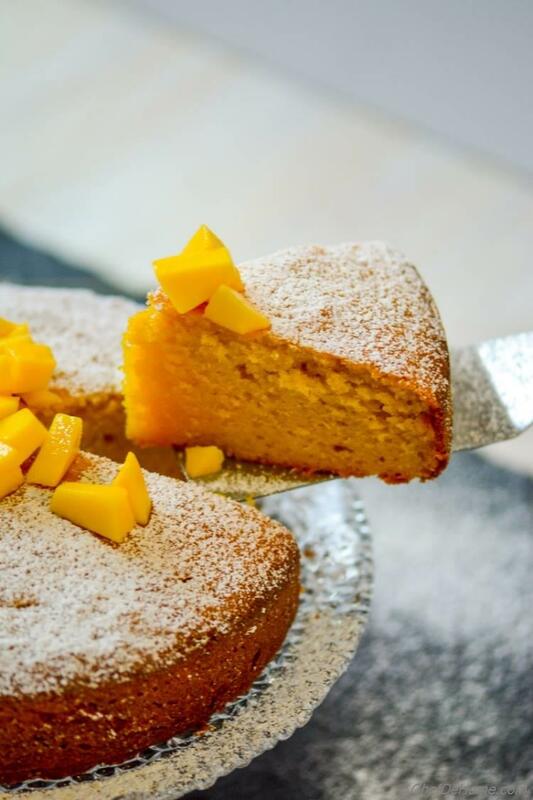 Moist and spongy... but the funny thing is, the cake taste like banana cake rather than mango cake..
Hi Savita, I have a big can of beautiful kesar mango pulp that I want to use as much as I can in this cake to maximise flavour. My questions are- Can I use tinned pulp instead of fresh mango? 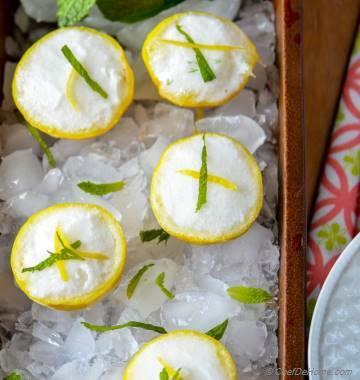 Can I substitute other wet ingredients like the coconut milk to get more flavour of the mango? I could then maybe use a frosting or filling of thick coconut cream. What do you think? Thanks for sharing! 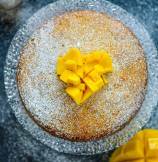 Hi Radhika, tinned mango puree works perfect for this cake So go for it. Regarding coconut milk, you can substitute wet ingredients with others but baking temperature and dry ingredients should be adjusted accordingly. If you watch my video, you will know what consistency of batter I have. Feel free to use any frosting you like. I hope it helps. Hi Devan, I'm gad you enjoyed Mango Cake. My cake is in the oven as I write,reviews were encourage g and helpful.Hope it turns out well,I&#39;m sending for iftari to a friend. can i use whole milk instead of the coconut milk? Hi Laura, I often use heavy cream instead of coconut milk but I think whole milk should be just fine. I would not use fridge cold milk but at room temperature. I hope it helps. Hi Aarti, i think, if cake rose quickly it means temp was very high when it went in. I'm not sure if you will still have it in oven but covering top with aluminum foil can prevent cake from getting brown before it's fully cooked. I hope it helps. if your oven gets consistently higher in temperature then try pre heating it at a lower setting by say 25 degrees Fahrenhiet.